FOUND: The Bike Paper Craft Calendar from Good Morning. Inc.
OK, so we are 20% finished with 2018 already (believe it or not) and you may think it is too late for a new calendar. But consider there is still 80% of the year left and 2018 calendars are now deeply discounted. 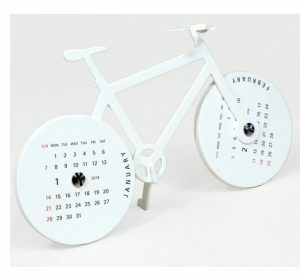 Add to this equation the awesome Bike Paper Craft Calendar from Good Morning. Inc. available from the fine folks at Buy Olympia and you have what we call a win, win, win. Find the Bike Paper Craft Calendar from Good Morning. Inc. at Buy Olympia here. See all the cool items from Buy Olympia here. Lost Cowboy is powered by	WordPress 5.0.4 and delivered to you in 0.929 seconds using 40 queries.